India's second-biggest IT firm Infosys said on Saturday it will buy back shares worth up to 130 billion rupees ($2 billion), a day after Vishal Sikka resigned as chief executive after a long-running feud with the company's founders. 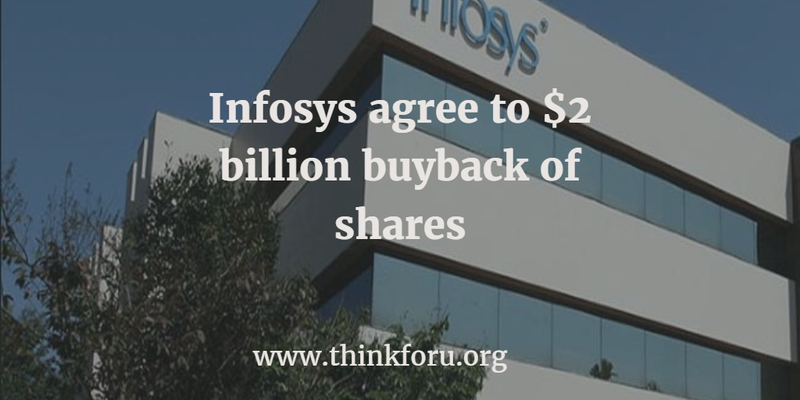 The board of Bengaluru-headquartered Infosys approved the repurchase of 113 million shares at 1,150 rupees apiece, the company said in a stock exchange filing, returning cash to investors at a substantial premium to Friday's closing price of 923.25 rupees. The announcement of the company's first-ever buyback will offer some respite to Infosys shareholders, who saw a near 10 percent fall in the value of their holdings on Friday after Sikka's surprise exit. Sikka, the first non-founder chief executive of the company, announced his sudden resignation following a protracted war of words with the founder's group, led by Narayana Murthy. The move is also likely to calm some former executives who had been clamoring for a buyback as a row between the founders and the current management of Infosys over alleged corporate governance lapses at the company spilled into the public domain.